Managing your money to reach your financial goals is a never-ending activity. But as the end of the year approaches, there’s still time to make progress towards your yearly goals. 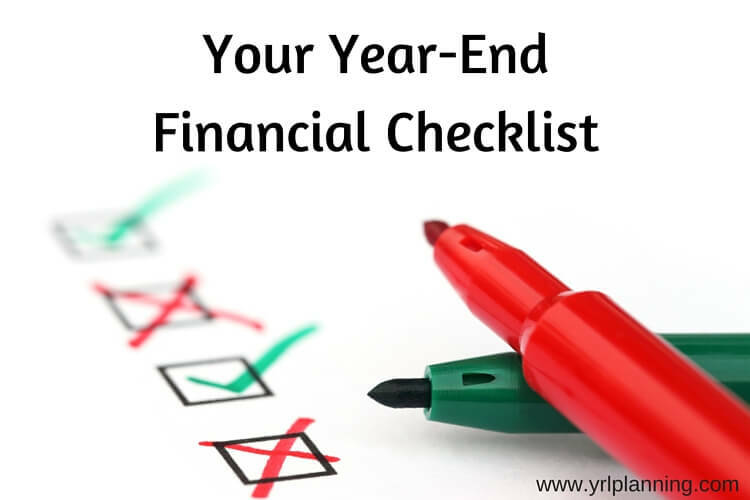 Use this financial checklist to see if there’s anything you can do before the end of the year. With the tax year winding to a close, a few moves might make a big difference. Every financial move should be made within the context of your larger plan. So as you head towards the end of the year, how is your year looking? What has gone right, and what’s been less successful? Take a look at what you’ve spent and what you’ve saved for the year. Sometimes adding the year up all together makes it clear to see exactly where your money is going. Life isn’t all about finances. When you think about how you spent your time, are you happy with how you’ve spent it? When you think about all the ways you hoped you’d improve over the year, did you make progress? Money is meant to be used to help you live the life you want — one that you enjoy now and one that you’ll be able to keep enjoying in the future. When you look at how you’ve spent your time and money, is it in line with your larger goals and values? When taking steps to make sure next year is a better year, it’s always good to be honest about exactly where you’ve succeeded and failed. You can’t make changes for the better if you don’t know where you are. Most of a portfolio’s return over time is determined by the mix of investments you own in your portfolio (or asset allocation) rather than the underlying individual investments. Higher risk investments like emerging markets usually have a higher return over time than lower-risk investments like bonds. Since each asset class grows at a different rate, you need to rebalance to maintain your ideal investment allocation. If you don’t rebalance, your investments might become too heavily weighted towards one particular asset class, like stocks, where you’d be exposed to a big downturn in the market, or towards bonds, meaning you’ll have a lower return over time than you’d like. Rebalancing is also a structured way to buy high and sell low. If you haven’t rebalanced recently, make sure to take the time to do so before the end of the year. Beneficiaries for retirement accounts and life insurance go directly to the recipients named, not according to the names listed in a will or trust. Do you remember who you scribbled down when you were filling out your paperwork? Did your company change their 401(k) provider and you haven’t filled out a new beneficiary form? If you haven’t checked to verify the names in the last year, log in to your retirement accounts and life insurance policies to double check the names. This is especially important if you’ve been married or divorced in the last year. You want to make sure those beneficiaries are actually the people that you want to receive the money. The deadline for contributing to your employer’s retirement plan is December 31st. Are you on track to max out your 401(k) by the end of the year? Some plans require a top-up to make sure that you’ve fully maxed out the plan. If there’s still room, see if there’s anything you can do to squeeze a bit more in. If you have extra money from a holiday bonus, this can be a great use of the funds. You’ll pay less on taxes and save for your retirement. If you’d like to give to charity, doing so before the end of 2015 means you may be able to deduct the donation from your 2015 taxes (if you itemize your deductions). If you choose to give appreciated stocks, you can deduct the cost of the current market value of the stock without paying capital gains on the investment gains. Many charities know how to handle donations made in this way, but you’ll always want to double check before you make the donation. If you have any losses in your investment accounts, selling the ones that are worth less than what you bought them for will let you offset capital gains from other investments so you can save a chunk of change on your tax bill. This process is called tax loss harvesting. You can also usually write off an additional $3,000 a year in capital losses against your ordinary income. Additional losses also roll over to future years. There’s one nuance to pay attention to when you’re reinvesting the money. When you sell the investments, make sure you don’t re-purchase the same investments. If you sold Chevron, you can’t re-purchase it right away (or within 30 days) or you’ll trigger wash sale rules. Two different mutual funds, even if they mirror the same index, are considered different investments and do not trigger the wash sale rules. Taxes are a big expense, and it makes no sense to pay extra in taxes beyond what you have to. Taking the time to tally up the bill before the new year turns over is a good idea. Many of your opportunities to save in taxes expire at the end of the year. If you’re going to be hit with a big tax bill, there are still a few things you can do to reduce the burden. You can contribute extra money to a pre-tax account like a Health Savings Account (HSA), a traditional pre-tax IRA (but make sure that you qualify according to IRS rules), or stick a bit more from the holiday bonus into your 401(k). Giving to charity is something you might want to do regardless of your tax bill, but giving to charity may also reduce your taxable income. If you still know you’re going to owe more in taxes, running the numbers now means you’ll still have time to save before the big bill is due in April. If possible, you can send in extra payments before the end of the year to avoid penalties from underpaying your taxes. With your year-end review and any last minute moves completed, you’re all set to figure out where you’d like to land next year. Spend a moment to set goals for the next year. What are you going to do differently this year so you’ll end up better off a year from now? Don’t stop at just setting the goal! Research has shown that you are much more likely to stick to your goals if you plan out the actions you will take to reach your goals. When you are setting your goals for the next year, create an action plan for how you will achieve them and share them with your friends, your family or your Facebook feed. If you’d like to save more for retirement, log on to your retirement account and bump up your contributions by 1% right now. You’ll barely notice the difference, and you’re one step closer to reaching your goals. Whatever your goal is, find a small thing you can do now. It’s never too late to make progress towards a better financial future! At Your Richest Life, Katie Brewer, CFP®, believes you too should have access to financial resources (like this financial checklist) and fee-only financial planning. For more information on the services offered, contact Katie today.